The World Cup has not started yet and Nigeria has already won -- for being the most stylish team in Russia. It started with the fan frenzy to to buy the Nigeria Nike-designed World Cup kit, which sold out globally on the day it was released, with queues snaking round the block outside the Nike store on London's Regent Street. Football fans queue outside Nike store in Oxford, London for the newly released Nigerian kits designed by Nike for the 2018 World Cup on June 1, 2018. Nigeria had heads turning again for the team's outfits as they arrived in style ahead of the tournament in Russia. Fans are talking about their stunning white and green ensemble set off with a matching hat, worn at a jaunty angle. The Super Eagles, as the team is known, arrived looking crisp in starched white traditional attire, known locally as the kaftan. The knee-length white shirt was embroidered with a green eagle representing the country's green, white, green colors. Social media was quick to react after the National Football Federation shared the images online. There was so much chatter online that Twitter dedicated a 'moment' to it. Twitter user Kirekaboy wrote: "Has anybody seen how the Nigerian team was dressed as they landed in Russia?...I have never seen a people so proud of their culture." While another wrote: "Nigeria's World Cup squad rocking that slick cricket umpire meets confident gospel choir singer look. Just give these guys the trophy now." There's no denying the love for the Nigerian players' outfits as they prepare for the start of the World Cup tournament on June 14. 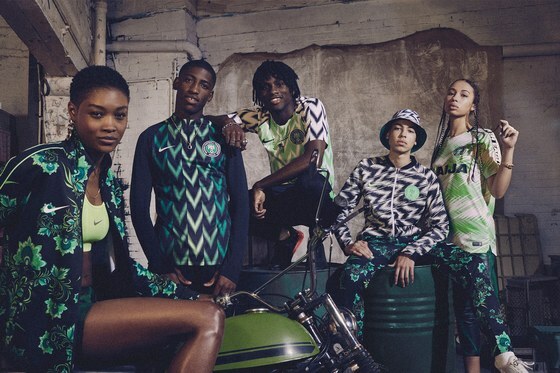 Nigeria's Nike-designed kit was voted the best of the World Cup in several polls, including UK broadcaster Sky. International men's magazine GQ also voted the Super Eagles strip top the best of all the 32 teams in Russia. The highly-sought after kit received three million pre-orders before it's release, according to Nigerian Football Federation. Design director Peter Hopkins told Fader magazine that the Nigerian team's confidence inspired him in his designs for the kit which has a bold neon green pattern that echoes the pattern of eagle wing feathers. He said: "There's a confidence in all these young players, they're going to go for it and we were attracted to that." "We've been following them from afar, and the players on social media...a lot of them are playing in some of the top clubs in Europe, and there's that boldness that aligns in Nigeria and Lagos and in London. "We thought that there's something in here to do something different," Hopkins added. The kit has also been the subject of intense discussions in Nigeria where some people thought the football federation had missed an opportunity to boost local manufacturing. One prominent politician said outsourcing the kits to be produced outside the country contradicted the Nigerian government's plans to expand and encourage production of 'Made in Nigeria' goods. Senator Ben Bruce said the country could have made $100 million if the kit was made in Nigerian factories. The lawmaker said,"Just imagine if those 3 million Nigerian Super Eagles jerseys were made by a firm in Aba (a Nigerian state famed for local manufacturing) rather than Nike. Aba tailors have the capacity to produce them. "We just lost an opportunity to infuse at least $100 million into the Nigerian economy and provide jobs for our youths," he said. However, some enterprising young Nigerians have seized the initiative and are looking to cash in on the vacuum created by the sold out official Nike jerseys. One example is the 'Unity Collection," created by Chekwas Okafor, founder of e-commerce site OnChek in collaboration with designer Adebayo Oke-Lawal of Orange Culture and footwear designer Shem Paronelli. The designers said they wanted to pay homage to the Super Eagles with their version of the jersey. Okafor told CNN he conceived the idea to make jerseys for the national team back in 2014 when he noticed that Nigerian creatives were not active in the sports industry. "My goal was to show that we can leverage our creative industry to make products like jerseys. We only stocks brands on our site that make their products in Africa. I also want to show that we could make similar products in Nigeria, in large scale," he says. The Unity kit is more than a jersey, it is also a medium to tell the Nigerian story, he adds. "The Unity collection is made up of many parts, it tells a story of differences, cultures, traditions, and dialects. It's a story about the one thing that brings us together. A story about unity. The story of Nigeria."